Abstract: I develop a model that endogenizes entry into the market of competitive political violence. 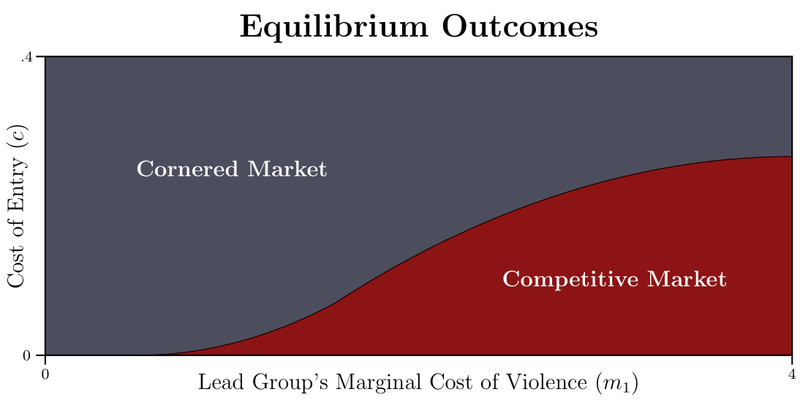 In equilibrium, an existing group may overproduce violence to corner their market and deter entry by a potential competitor. Contrary to some hypotheses about outbidding, violence can therefore be greater with only a single group than when the second group enters the market. I then investigate four manners by which a target government might mitigate the violence: offensive measures that undermine the lead group’s marginal cost of violence, defensive measures that absorb a portion of all violence, deterrent measures that increase the cost of group formation, and concessions to the group’s audience to reduce grievances. Of these, only defensive measures are guaranteed to decrease violence; increasing the burden of entry and decreasing grievances can counterintuitively increase violence. Click here to download. Slides.